The Hario Skerton was a decent grinder before. But with the new and improved design, it’s a really attractive package. It’s compact, grinds uniformly, and is built to last. At this price point it’s hard to find a better grinder. The Hario Skerton is one of the most iconic hand grinders out there. For many years it was one of the only better options in the budget range. It wasn’t a magnificent grinder though. Recently Hario has released a new and improved version: The so-called Hario Skerton ‘Pro’. I have had the grinder for a couple of months now, so I have had plenty of time to get familiar with the small tweaks and upgrades to the old model. In this review, I will go through all the small details and tell you how the ‘Pro’ is different from the original, and of course also take a close look at the grind. If you are thinking about getting the ‘Pro’ (which you should), then read on. Hario is a Japanese company that is famous all over the world for their coffee equipment. The brand’s most well-known product, of course, is the Hario V60 pour over cone, but the kettles, range servers, and grinders are also popular among specialty coffee consumers. 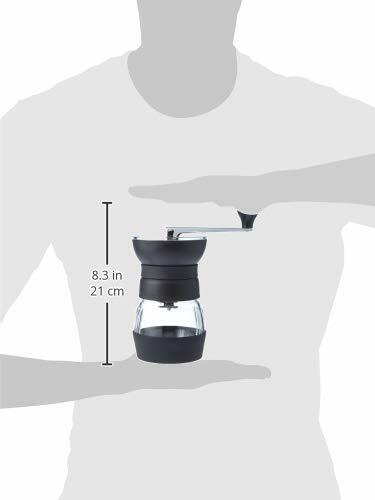 Hario combines minimalist and cute Japanese aesthetics with quality, usability and a good price. The company produces several grinders by now, and you could say that the new Skerton Pro fits somewhere in the upper middle of their range. But before we get into the meat of this review let’s just talk briefly about manual grinders. 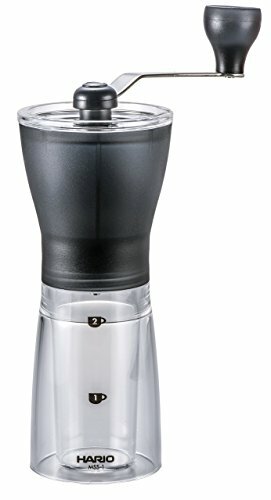 Why even bother with grinding your beans in the hand, when you have plenty of electric models that are more than capable out there? Well, I will give you my reasons. Usually, electric grinders are way more expensive than manual grinders. When you buy an electric version, most of the price tag covers the motor and the housing. The burrs usually aren’t anything spectacular. That means in raw grinding capability, you get a lot bang for your buck when purchasing a hand grinder. Another great reason to consider a manual grinder is that it’s way easier to bring with you when you go camping or go on holidays. Having a grinder and a nice little brewer, such as the Aeropress, with you, really makes your trip so much more fun. Trust me on this one! 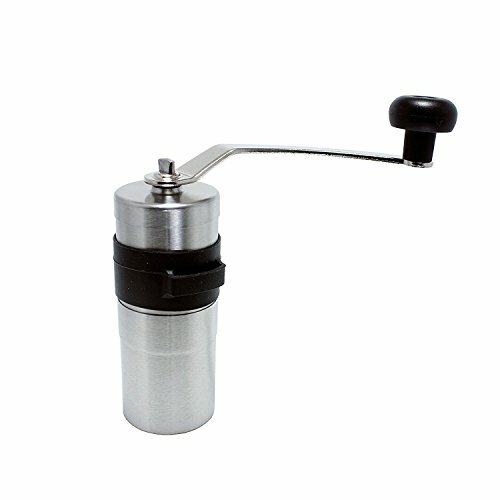 So even though you might wanna use an electric grinder on a daily basis – after all it’s way easier to just press a button – you should consider the hand crank grinder just for the sake of travel. Beautiful design and nice materials. This grinder definitely seems more premium than its predecessors. Little to no burr wobble. A significant upgrade over the old ‘regular’ Skerton. Grinds faster than most other hand-grinder in this price range and also has a large capacity. The first thing you notice, when you get the new 2018 model in your hand is how premium and nicely designed it is. My girlfriend even proclaimed that it was ‘sooo cute’, which is an honor normally only reserved for cats on Youtube. You have a grounds bin that’s protected by a silicone layer that also acts as non-slip stabilizer mat if you want to place it on a table while grinding. Then you have the combined hopper and burr unit, where you fill in the beans. On top of that, you have a nicely curved plastic lid that fits perfectly. And lastly, you have the new and improved metal crank. This handle is built to last! Hario has done a magnificent job here. All parts fit perfectly together and feel very solid. Besides the glass grounds bin, it’s hard to see any of these parts break from normal use. It’s also worth mentioning that a normal mason jar will fit as a grounds bin, so should you have an accident, it’s not really the end of the world. Especially the metal crank and the curved plastic lid are nice upgrades to the ones used in the original Skerton. 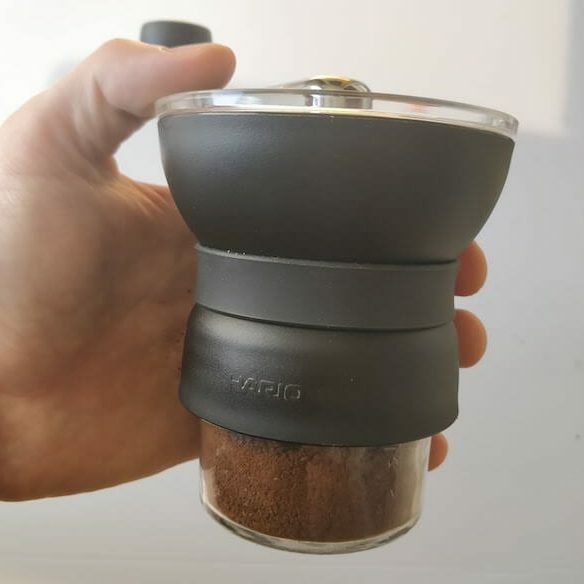 As expected from a fairly low tech device such as a hand grinder it’s pretty easy to use: Pour in the beans in the top, get the biceps to work, and after a minute or two you have freshly ground coffee! Compared to the earlier generation of the Skerton, this model features some significant improvements when it comes to usability. Before the lid was made out of silicone and you sort of had to massage it into place. The new lid has this very nice, curvy design, so it almost locks into place immediately. The crank handle has also been updated. Now it locks in place by being put on an Allen wrench. For me, it’s no problem holding the grinder in one hand and turning the handle with the other. However, if you have really small hands it might be more comfortable in the long run with a slimmer grinder. Adjusting the grind setting of the old Hario Skerton was complicated. You had to take off the lid and a special locking ring, and then turn a knob. Not only was this overly complicated, but because you didn’t get any tactile feedback it was way harder to navigate the settings. What the new Skerton Pro has done is to borrow the system from another Hario model – the Hario Slim Mini Mill. This means that you can now adjust the grind setting underneath the burrs, by turning a small ring that gives you a small ‘click’ for every increment. This makes it a lot faster and easier to adjust the coarseness, when you wanna go from, say, espresso to pour over. How fast does it grind? The Hario Skerton Pro does a very decent job when it comes to speed. 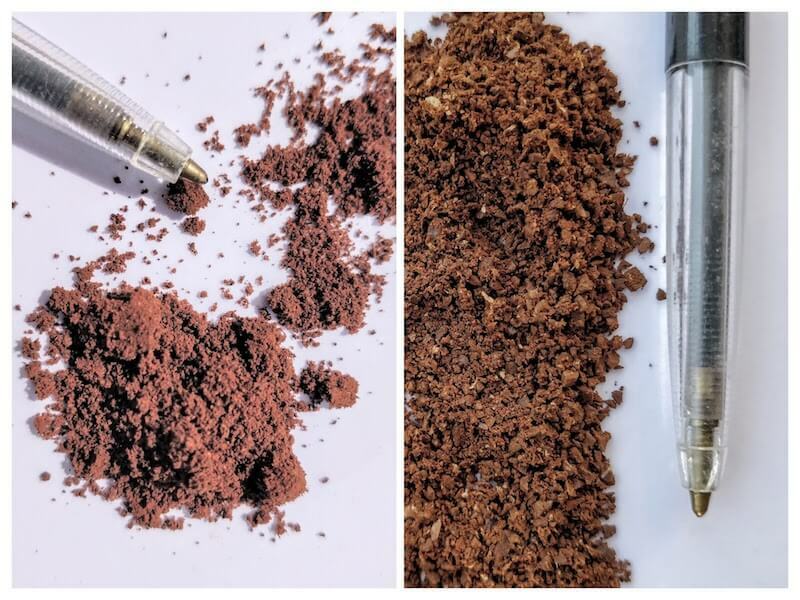 I usually use 26,5 grams of coffee to 400 grams of water for my daily pour over coffee and the grinder was able to grind that on a medium-fine setting in 1 minute and 22 seconds (see the picture below). For me, I’m perfectly fine with that amount of time. This grinder definitely grinds fine enough for espresso. Just be prepared for some work. It takes me around 2 minutes to grind 14 grams of ultra fine espresso grounds. I tested the grinder next to its little brother, the Hario Slim and the OE Lido 3, and as expected it was somewhere in between these two. The Lido 3 was faster, but not as much as you might think. On the left: Ultra fine for espresso. Right: A medium-fine grind for Aeropress or pour over. As you can see from the picture the grind consistency is quite good, although not perfect. For everyday use, it’s more than okay, however. Fines sometimes get a bad rep, but actually, a little amount doesn’t really affect the brew that much. 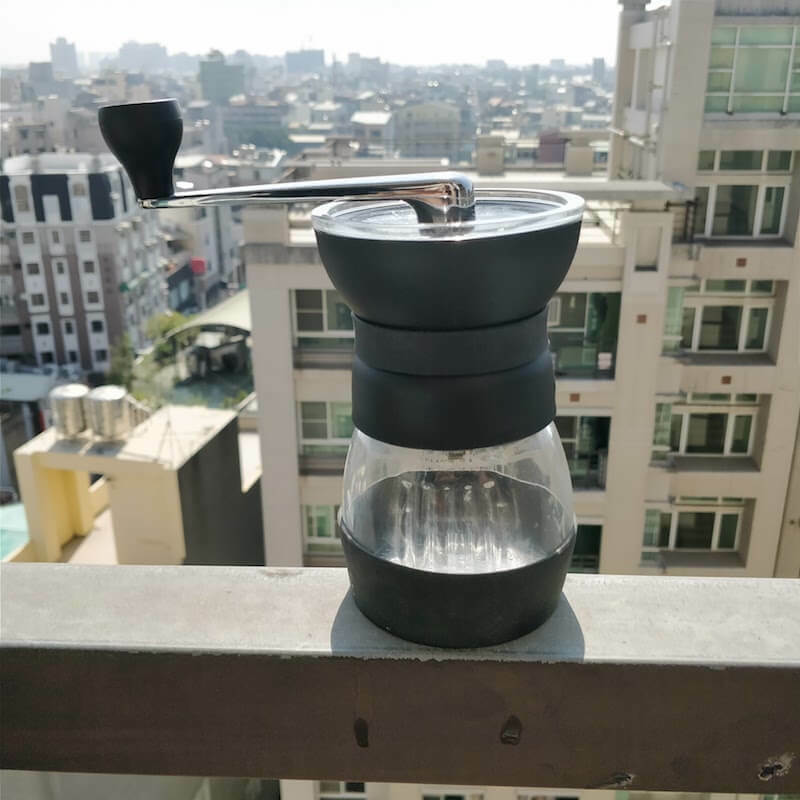 I have found that I have been able to brew on devices such as the Hario V60 and Clever Dripper without any issues with over-extraction or a clogged filter. Compared to the old Skerton the grind for French Press is also a lot more uniform. The new design of the housing means that the burrs wobble less on the coarser spectrum. I was surprised that the Skerton grinds so well for espresso. At its finest, it actually grinds too fine, which will clog the portafilter. So you need to dial it in. A smaller mason jar also can be used as a grounds bin. That way it quickly turns in to a more portable grinder. The Hario Skerton Pro is in every single way an upgrade over the old model. The little difference in price doesn’t justify going for the old one even if you’re on a budget. 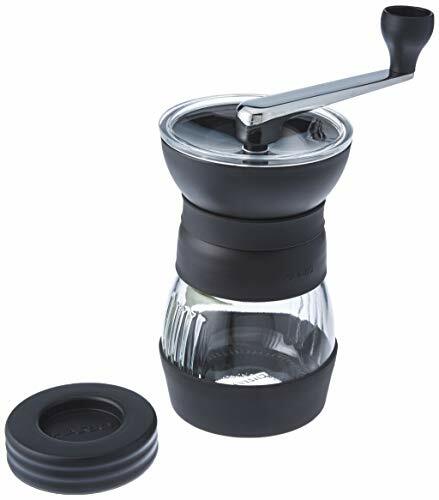 The Hario Slim Mini Mill is a nice grinder too, and if you’re only looking for a travel grinder you could look in that direction. It is way slower to grind on though. The Porlex JP 30 Mini is another great travel grinder that is even smaller. But for an all-around manual grinder in this price range, it’s very hard to find any true competition. You’d have to look at something that is at least 3-4 times the price to find any significant improvements in quality and grind consistency. And in fact it’s totally possible to use the Skerton Pro for travel with this little hack: The grounds bin of has the exact same diameter as a mason jar, so you can easily find a smaller one made of plastic. With a small plastic jar, this grinder is only a total of 265 grams, while the Hario Slim is 245 grams. For those 20 grams extra, you get a grinder that is a lot faster and smaller height-wise. The Hario Skerton Pro offers great grinding, fantastic build quality, and design at a budget price. 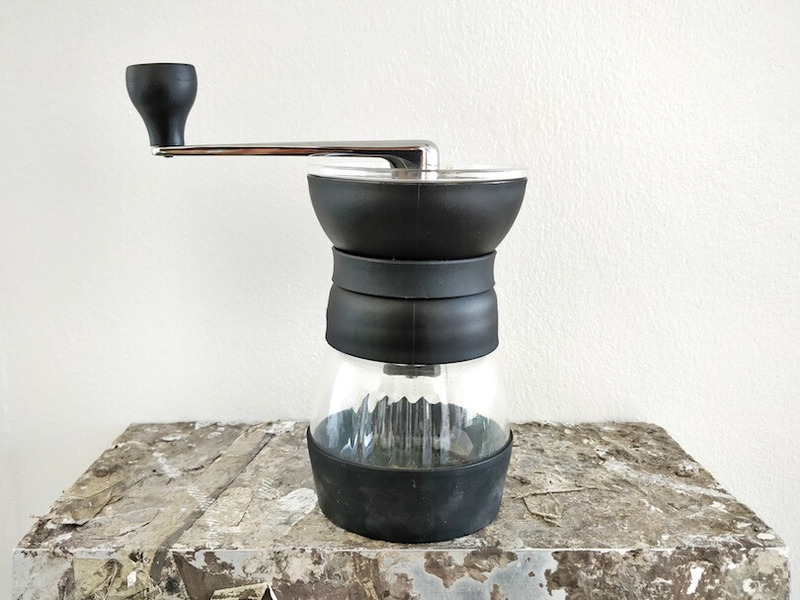 It’s hard to beat this combination, and for this reason, we recommend the Hario Skerton Pro for both beginners looking for a budget grinders and more experienced coffee people who are looking for a portable grinder.